Mac buyers in 2016 and beyond could have the option of purchasing a machine powered by Apple's A-series processors, which currently sit at the heart of the iPhone and iPad, according to KGI Securities' Ming-Chi Kuo. In a new report released Wednesday, a copy of which was obtained by AppleInsider, well-connected analyst Kuo suggests that Apple's in-house chips will reach a level of performance somewhere between Intel's Atom and Core i3 lines within the next 1-2 years. Removing Intel from the equation would allow Apple to better control the launch timing of the Mac line, he believes. Analyst Ming-Chi Kuo believes Apple could ditch Intel and release Macs with custom A-series chips within the next one to two years. Additionally, Kuo believes the company is laying groundwork to diversify the fabrication of its custom-designed processing units, including the iPhone and iPad's A-series and the Apple Watch's S-series. 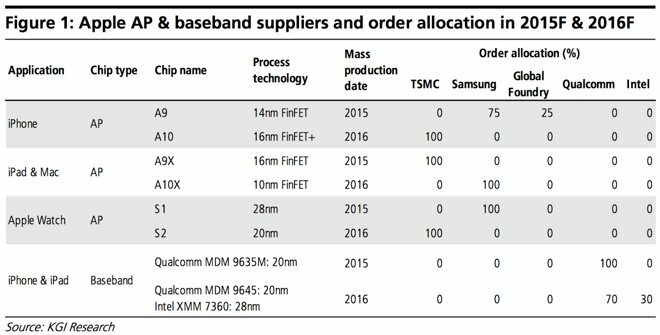 Samsung is expected to split orders for the iPhone's next-generation A9 with Global Foundries, while TSMC would handle the A10 in 2016. 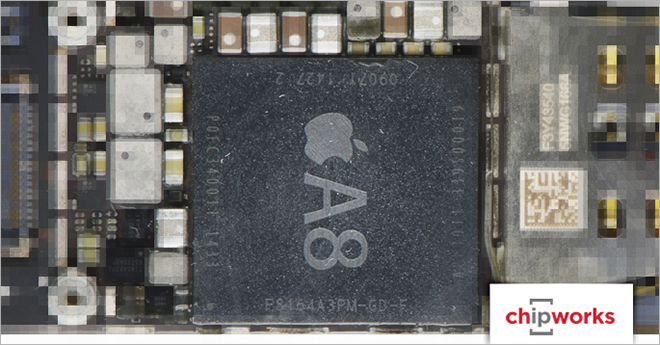 The A9X— which would power both the iPad and a new low-end Mac— would be fabbed on TSMC's 16nm line, with the A10X moving to Samsung's 10nm plant. TSMC is also expected to take over S-series production from Samsung, beginning with the S2 in the second-generation Apple Watch. Perhaps the greatest strides forward for Apple's custom silicon were made in 2012 with the debut of the A7 chip, the first ever mass-produced 64-bit chip for mobile devices. Tests found that the A7 was a desktop-class CPU well beyond what traditional mobile chips had been capable of up until that point. Apple followed up in 2013 not only with the launch of the more powerful A8 processor, but also with a beefed-up A8X CPU that powers the iPad Air 2. 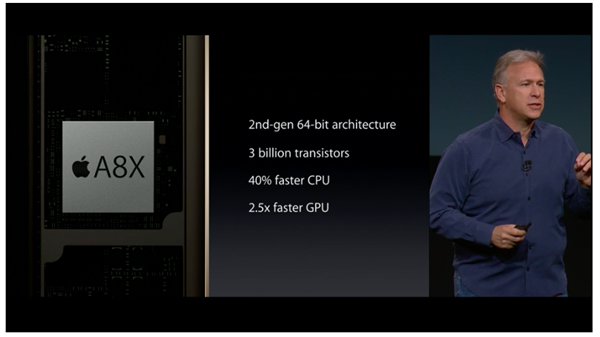 The processor's three-core architecture features approximately a billion more transistors than the A8 that powers the iPhone 6 and iPhone 6 Plus. Rumors of future Macs with custom ARM-based, Apple-designed chips have been around for years, well before the A-series processors became desktop-caliber CPUs. But Apple's Mac chip supplier Intel has made strides in power consumption with its own silicon in recent years, allowing for MacBook models with battery life beyond 15 hours of maximum uptime, more than enough for the average user's workday. Still, Apple is reliant on Intel and its chip release schedule for major Mac upgrades, as evidenced by the lack of significant improvements to the Mac lineup in 2013. Faced with delays for Intel's next-generation Broadwell processors, Apple instead opted for minor speed bumps accompanied by price cuts for its MacBook Air and MacBook Pro series. Of course, a switch from Intel processors to custom ARM chips would be a major transition for Apple, not only in terms of hardware, but also software for its OS X platform. One rumor from earlier this year claimed that Apple had built a "completely equivalent" OS X operating system in ARM, with several prototype machines already said to have been developed. Specifically, it was said that Apple has developed an iMac desktop with four or eight 64-bit quad-core CPUs, while a Mac mini is said to have been made with four such cores. In addition, it was claimed that Apple has developed a 13-inch MacBook sporting up to eight 64-bit quad-core ARM chips. Apple already made a switch along these lines once, in a massive transition from IBM's PowerPC chips to Intel's line of processors. That switch proved beneficial to Apple, allowing its machines to run Windows and also tapping into Intel's speedier chips, and as a result Mac sales went to new highs.